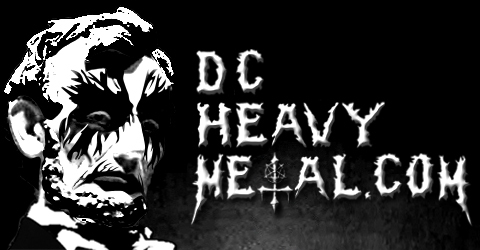 That’s right, in celebration of DCHeavyMetal.com entering its third year of existence, I’ve decided to hold a mega contest giving away a pair of tickets to three different upcoming metal shows! There will be three different winners, not one person getting all three. Just leave a comment at the bottom of this post telling me which of the three concerts you’d like to go to and I’ll use Random.org to pick three winners, one for each concert, on Monday the 19th of September 2011 at 6pm EST to win tickets. You can only win for one concert but you can enter to win for all three or whichever ones you’d like. Be sure to use a valid email address when you enter so I can tell you that you have won, though it doesn’t have to be visible in the post itself. Don’t worry I won’t add you to any email lists or anything annoying like that. Read below to see what the three metal concerts are, and choose wisely! On Wednesday the 21st of September the West Virginia based Karma To Burn is coming to the Rock & Roll Hotel. Karma To Burn is an excellent sludgy stoner band and they play a lot of instrumental songs, though some have vocals. To make this show even better, DC’s own Borracho will be opening. They are an excellent stoner act that you should be sure to check out if you haven’t already. Borracho recently put out their first LP titled Splitting Sky and this show would be a great chance to save on shipping and pick it up after seeing them play live. Local act King Giant was supposed to play this show but due to an injury to one of the band members they have had to cancel their appearance at this concert. If you don’t win or you just can’t wait, you can get tickets to this show here for $10. On Friday the 23rd of September the brand new 2,000 person capacity Fillmore in Silver Spring will host its first ever metal concert! 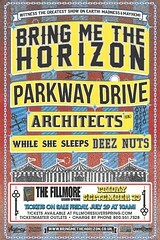 British metalcore band Bring Me The Horizon headlines a night of some of the best core bands coming from the UK and Australia such as Parkway Drive, Architects, While She Sleeps and Deez Nuts. 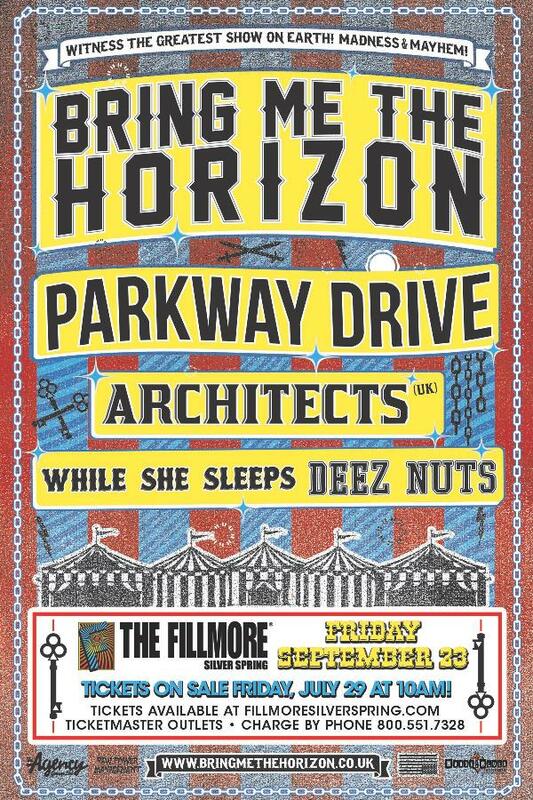 And come on, if you win you can spend all week telling people you won tickets to see Deez Nuts. The Fillmore will have just opened on September 15th so this will be the first chance to destroy the place with some insane mosh pits! If you don’t win or you just can’t wait, you can get tickets to this show here for $23. Kyuss Lives! is the name of the reformed version of legendary stoner band Kyuss featuring all the original members of the band except Josh Homme (he’s busy playing with super group Them Crooked Vultures these days). So now the band has Bruno Fevery on guitar but what’s really exciting is that they have been working on a new album and, assuming they play some of that on this tour, this show will be the first chance this area is going to have to hear new Kyuss material in over 15 years! To make things even better Texas based doom masters The Sword and Atlanta’s Monstro are opening. This show is on Saturday the 24th of September at the 9:30 Club and you know it’s going to be awesome. If you don’t win or you just can’t wait, you can get tickets to this show here for $30. I would love to see K2B! I’m a fellow Mountaineer. This is a great site, and I hope you keep it around for many more years! 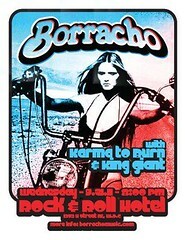 I have already bought my KYUSS LIVES ticket, so I would love to see Karma to Burn and Borracho! Stoneriffic! I’d like to see any of the 3 I can. I would sacrifice my first born child to see Kyuss Lives with The Sword! Pretty please?! Choice #3, please. Would love to see Kyuss. Choice three, 3. Kyuss please. Choice #2, BMTH & Parkway Drive! You won the pair of tickets to see Bring Me The Horizon! I would like to see Kyuss Lives. Choice Three would be KILLER! KYUSS!!! 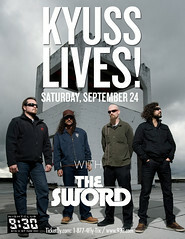 I’d love to see Kyuss live, with The Sword, sweet show! I’d go to any of the three! #3 please. Love The Sword and Kyuss! K2B. I was at wvu when they were starting out and have never had a chance to see them live. The Sword and palm deserts Kyuss!!!! Kyuss Lives! And The Sword kills! A chance to see Kyuss! Oh My! Pretty Please! My dreams have come true! You won the pair of tickets to see Kyuss Lives! I would love tickets to see Kyuss Lives. Thanks for the great site! I also wouldn’t mid Borracho tickets either. Thanks again! Bring me the horizon, man! Definitely choice One!! King Giant!!! You’re the winner of the Karma To Burn tickets! I’d love to see Kyuss Lives! 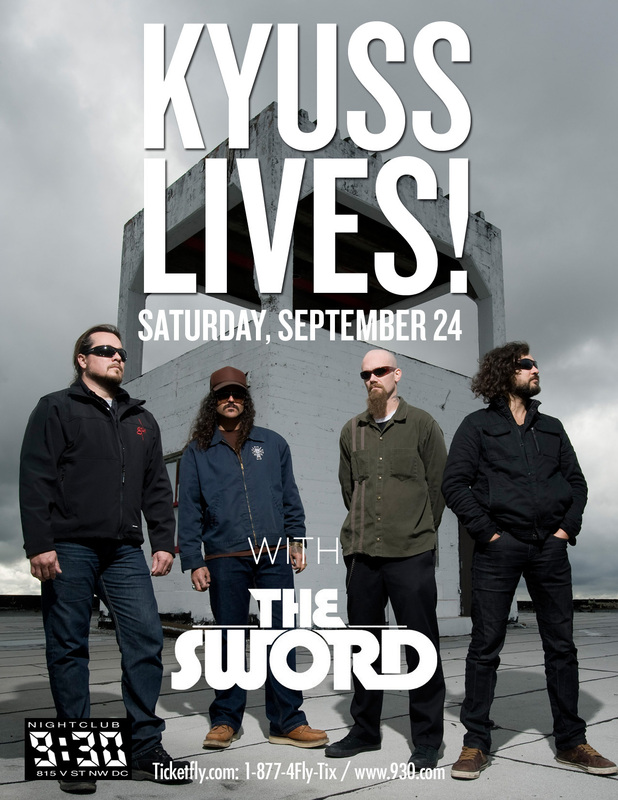 I want to see Kyuss Lives and The Sword! I saw The Sword over the summer, one of the best live bands imaginable, and Kyuss laid the foundation for some of the greatest music ever! !